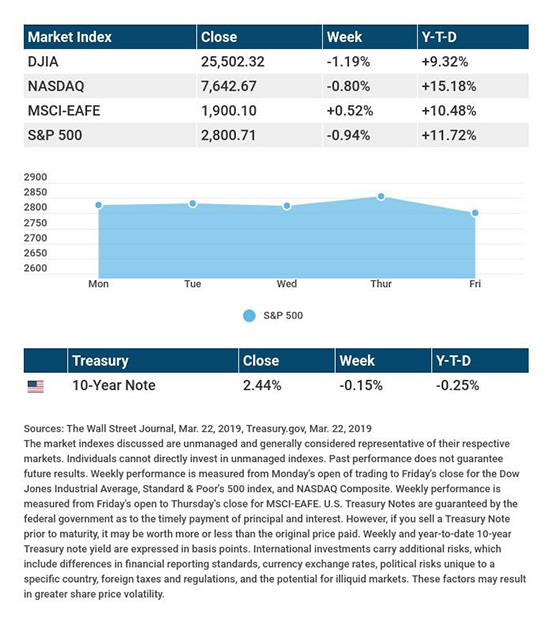 This weekend, the country learned that the infamous Mueller report exonerated President Trump of any collusion with Russia to influence the 2016 elections.1On Monday, the markets seem to be quiet while it digests the report and tries to figure out what, if any, market impact there is. At this point, the indicators are saying that we are back into (barely) a bullish trend in the market sentiment. Ask yourself the question, "if I was concerned about a 6-8% loss in my investment portfolio but still think I am okay taking risk, am I correct or just kidding myself?" Liquid courage can take many shapes, although it is normally synonymous with a drunk person becoming emboldened in their actions while their inhibitions are lower. Just like a bar, many investors become emboldened when the market rebounds or rallies and decide (often incorrectly) to raise their risk levels and chase the return. Do not be that person nobody likes in the bar...because when you sober up, you will come to realize your mistaken behavior and regrets are soon to follow. We had a loss in the S&P 500 from peak to trough of 20.20% (Sept 21st to Dec 26th).4 This should have continued for longer than it did and gone deeper than it did. In my opinion, we should still be speaking about losses, decline, and bear market condition, and yet, we are not. Unusual conditions call for patience, acceptance, and focus. Patience: investing is a marathon, not a sprint. We have to understand that we do not always have the ability to see far enough out to develop a comfort with a particular market sentiment since it seems to change frequently. We must wait to see what the market gives us and go from there-and that requires an understated amount of patience! Acceptance is necessary that we will not always see an increase in our investment values, yet we must be willing to continue the path and action forward to be successful long-term. Investors need to accept what they cannot control and pay attention to what they can. Focus on what we can control, our attitudes, and our actions. Remember what really matters in the end: achieving your goals and not the "how" behind achieving said goals. I have never met a client who, at retirement, tried to find out how much of their nest-egg was comprised of returns and how much was what they put in, because it simply does not matter. It's about the total amount and whether it will be enough that matters. Will 2019 be a profitable year? Maybe. A lot can change in 90 days in the markets, let alone 9 months! Till we speak again, enjoy March Madness; it has dual meaning this year! Securities offered through Regulus Advisors, LLC. Member FINRA/SIPC. Investment advisory services offered through Regal Investment Advisors, LLC, an SEC Registered Investment Advisor. Regulus Advisors and Regal Investment Advisors are affiliated entities. Summit Retirement Advisors, LLC and Summit Financial Group of Indiana are affiliated entities. Summit Retirement Advisors, LLC and Summit Financial Group of Indiana are independent of Regulus Advisors and Regal Investment Advisors.